Scrum boards are simple visual tools for increasing visibility and drawing attention to areas that merit further discussion. They are information radiators posted in a highly visible area that serve as the center of work discussions — how are we doing toward meeting our commitments, what risks do we need to mitigate, where do we need assistance, etc. — and drive focus and improvements. 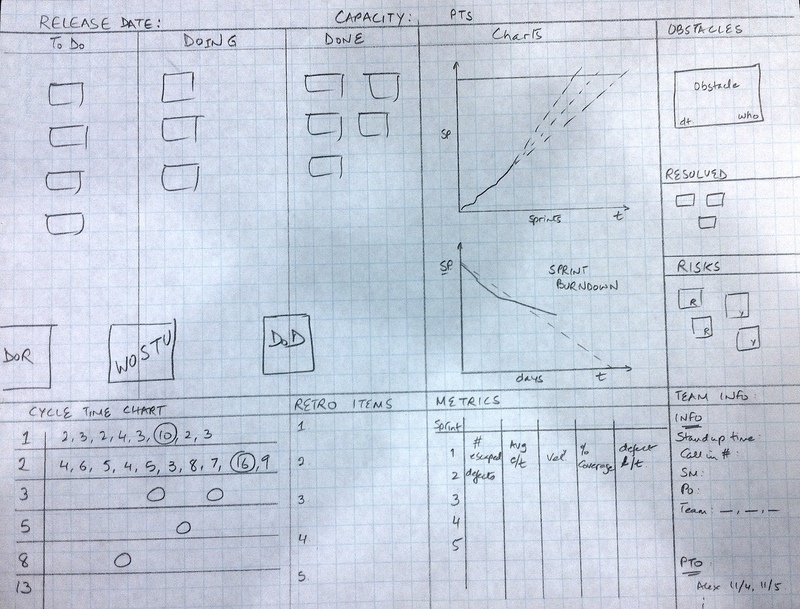 The teams I am coaching are currently using a Scrum Board modeled on the sketch below. 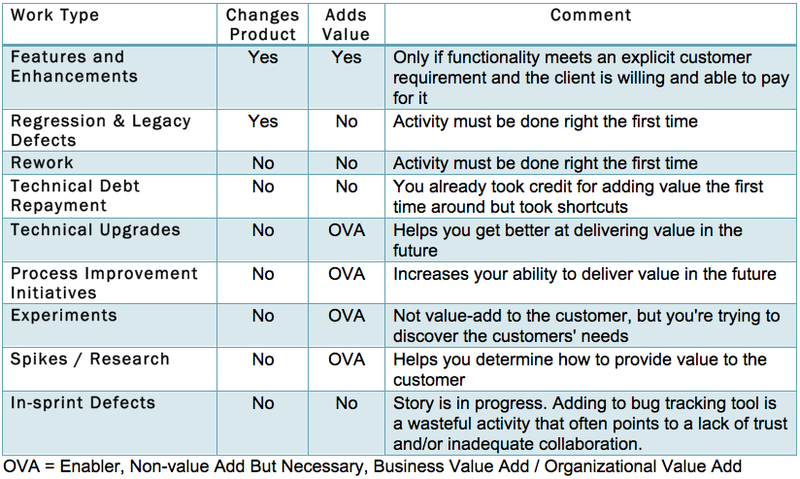 The top left of the board has three columns to depict progress of Product Backlog items or stories (not tasks). A Definition of Ready and a Definition of Done are used as well as a We Often Screw This Up (WOSTU) checklist. When a story is moved to the Doing column, the team members working on that story have a quick huddle to ensure they understand the goal, what they need to do to achieve that goal, the approach they’ll take, and to also remind themselves of things they often screw up. The WOSTU checklist is dynamic and changes over time — items are deleted once the team stops making the same mistakes. A cycle time table (lower left) is used to highlight stories that took significantly longer that anticipated and merit further investigation to understand what happened, why, and what the team can learn from it. This works equally well when the team has small stories and is simply counting the stories instead of estimating them using story points. The action items from the last retrospective are posted on the board as well to remind the team that they need to take action on those items; just talking about what could be improved doesn’t actually lead to improvement. Finally, a handful of metrics are shown as well. The metrics should be chosen carefully to highlight areas that the team needs to improve on. For example, the teams weren’t collaborating sufficiently and were operating in a mini-waterfall model; therefore, using average story cycle time to start the conversation was helpful. The cycle times will start going down once the team begins to change their approach to a more collaborative, less throw-it-over-the-wall approach. Scrum Boards are not static and it is expected that the team will continually adapt the Scrum Board to keep it meaningful for their own team and context. I fully expect the metrics section to change significantly over the next few sprints and the cycle time table to no longer be needed once the team becomes adept at splitting stories and focusing on story completion (and not on task completion). What interesting information do you usually track on your Scrum Board? Just because you want reality to bend to your wishes, doesn’t make it so. You can fight reality all you want and you’ll lose every time. Just like you can’t make a baby in three months despite working hard (putting in overtime and working nights and weekends), having the best intentions, and having an optimistic frame of mind (thinking positive thoughts, visualizing success), similarly, you can’t deliver on unrealistic expectations that are absolutely divorced from reality. Challenges are good, ridiculous demands aren’t! Executive fiat and management by fear only gets reluctant compliance not people’s enthusiasm, innovation, and best effort. As a Program Manager, your first order of business should be in resetting management expectations otherwise your teams will very likely become disheartened and demoralized. Help stakeholders and executives realize that there is more than thinking in binary oppositions of “all” and “none” — give-and-take on scope and depth of functionality is a good viable alternative.